Both Derby and I overdid things early this week, and I ended up cancelling my lesson last night. My entire body was sore from an ambitious workout, and Derby was sporting a fresh cut on his leg and a sore back, both most likely the result of playing too hard. Tonight we reported for duty, and we were both feeling better, though as we warmed up, I could tell that my leg muscles were still going to pose a challenge. My legs felt really tired and the muscles were burning just a few minutes into the lesson. After a few more minutes, I told Christy that I needed to get off the circle we were working on, because I just didn’t feel able to sustain the bend and all the corrections and adjustments necessary. I'll remember this when he tells me he can't sit into collection in a couple years. Nothing was going particularly well, and then things actually got a little worse when Derby spooked at some activity in the aisle. It was completely rideable, making for some funny video stills. And I got a much better trot out of the deal. 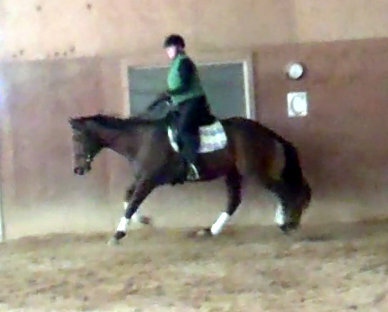 It was also an opportunity for me to “sit up and ride” as I used to when Maddie lost her marbles. And, as these situations are, it was a reminder that riding more purposefully and assertively yields results. Well, at least he's round. Until he pulled that crap again. 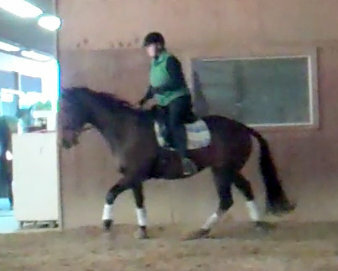 When he spooked again, I stuck my spur into his side and kept him cantering. 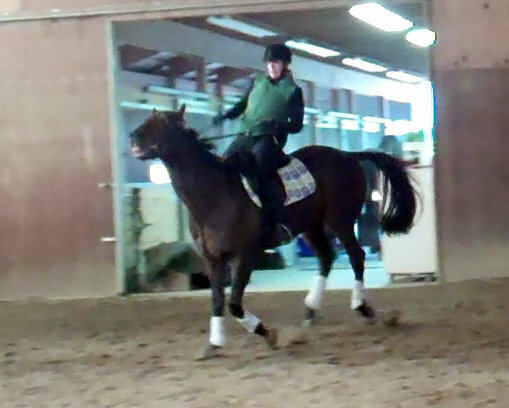 He actually picked up the wrong lead, so we went around and around and (*kick*) around counter-cantering. I was just hell bent on keeping him going, because, as Christy says, if you have the energy to spook, you have the energy to work. 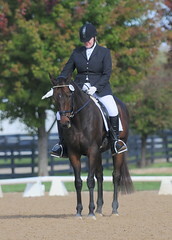 On a positive note, I supposed, Christy said the counter-canter was nicely balanced and he held it for a while. At this point, second level is light years away so I’m not too worried about this at the moment. 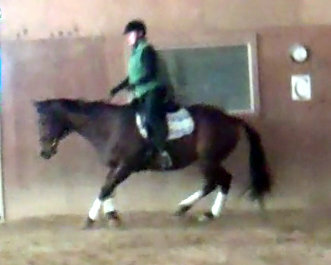 We transitioned into a trot, and I kept him going some more. He's like a drama-queen tween, intent upon looking good while making a scene. At this juncture, we finally got some nice work. Derby was really on my aids, and was electric and forward. He felt fantastic. And despite the nonsense, I felt good and in control pretty much the whole time. He came right back to me after each bout of the stupids, which is the outcome I prefer. However, at this point, I was about to slither from the horse. I was worn out – my leg muscles were completely shot. Not sure how I’ll feel tomorrow – I’m taking some Advil and hitting the sack!